I actually haven't done a lot of cooking with Israeli couscous before, but it seemed to fit a theme during a mostly Israeli-influenced menu I was cooking a few months ago. 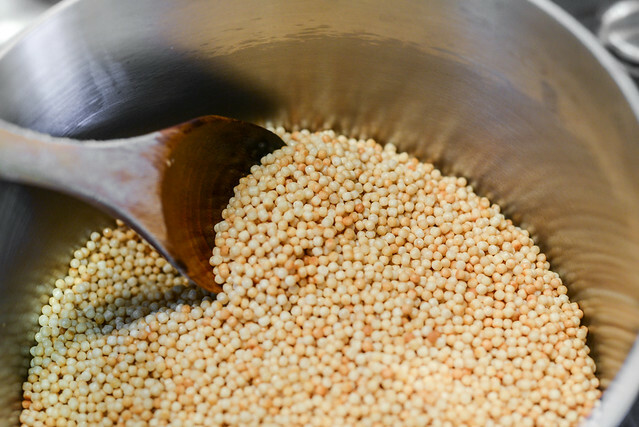 So I swapped my usual fine grained couscous for the larger pearls in the Israeli version and did some research on the best way to cook the stuff. I took note of a method I saw in Cook's Illustrated which first toasted the couscous until about half of the pearls started to turn golden brown before simmering in water. This seemed like a great way to inject a little more flavor into the overall dish. After toasting, then simmering the couscous for about 10 minutes, I transferred it to a parchment lined baking sheet for cooling while I attended to the other components of the salad. While looking for that perfect couscous cooking method, I also saw a salad on Cooks Illustrated that utilized pickled shallots, and thought they would be a great fit here. I was planning on this salad being primarily made with grilled veggies, and the sweetness of those vegetables would be contrasted well by tart and sharp shallots. So I quickly made some pickled shallots by thinly slicing a couple on my mandoline and then adding them to a mixture of vinegar, water, sugar, and salt that I had brought to a boil. I let the shallot sit in the liquid until it cooled, then strained. For the dressing, I took influence from just about everything else I was cooking that day, almost all which featured lemon in a big way. So freshly squeezed lemon juice and extra-virgin olive oil served as the base, and I rounded out the flavor with Dijon and hot paprika, then just seasoned with salt and pepper to taste. For the veggies, I used a mixture of two of summer favorites—squash and bell peppers. I utilized both zucchini and yellow squash, then a variety of colors of bell peppers so the final salad would have a very festive color to it. Before grilling, I cut the squash into quarter-inch slices and the peppers into four flat pieces each. I then tossed everything with olive oil, salt, and pepper before heading to grill. Over the hot, direct heat the veggies all browned and softened in no time. This is seriously my favorite way to enjoy these vegetables—the grill brings out so much natural sweetness, along with a little kiss of smoke, that they obtain so much delicious flavor. On any given day, I would have served the grilled veggies as is, but today they were destined for the salad, so after removing from the grill, I cut them all up into a medium dice. Now that I had all components complete, I placed everything in a large bowl and used a spoon to distribute evenly. I then transferred the salad to a serving bowl, where it sat for about 30 minutes until my guests arrived—this salad is totally meant to served at room temperature and great for cookouts and potlucks. 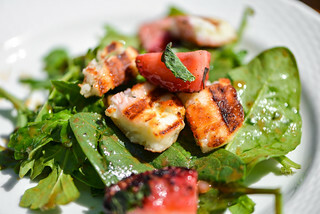 When I enjoyed this salad, it was still the middle of summer, and the flavors felt very apt and refreshing. 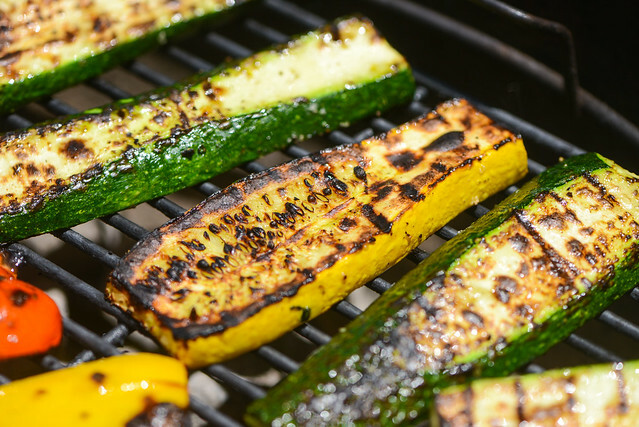 The grilled veggies were a center point that celebrated the freshness of the season along with an appropriate grilled flavor baked in that elevated them even more. The dressing was bright and lemony, providing that citrusy boost that made it all the more fitting to eat outside under the strong sun. Those pickled shallots did their job in creating a sharp and tart contrast to the veggies and dressing, and the couscous made it hearty and satisfying, without it feeling too heavy at all. 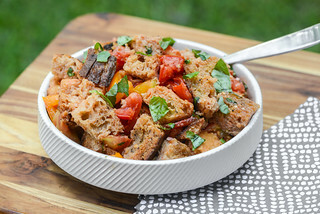 Altogether, it certainly was a great side when I first served it in the baking heat and humidity of July, and it would probably be even better now in the last throes of the pleasant heat before we transition totally into fall fare. 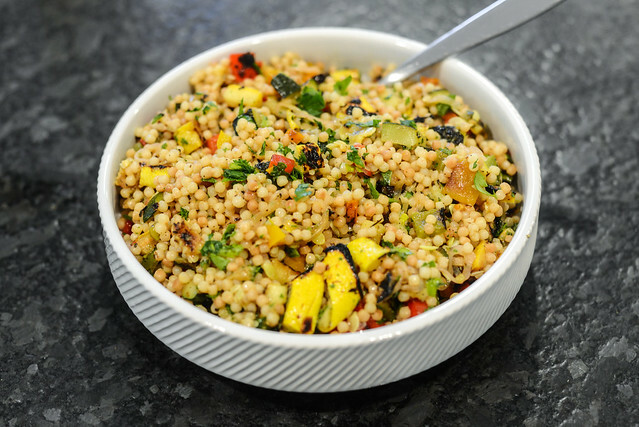 Grilled squash and peppers serve as the sweet and fresh center point of this lemony couscous salad that's perfect for a summer day, or to bring a taste of that season anytime of year. 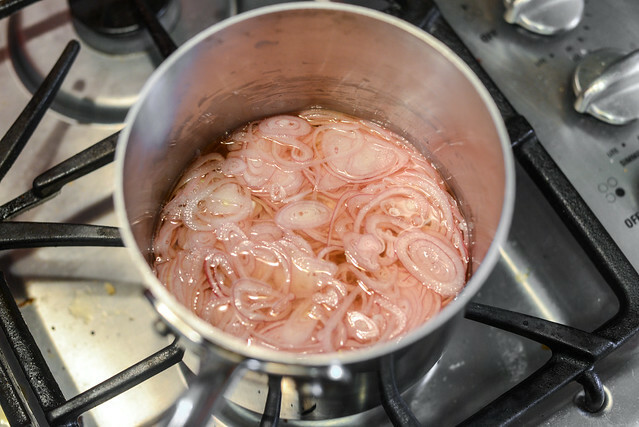 To make the pickled shallots: Whisk together vinegar, water, sugar, and salt in a small saucepan and bring to a boil over high heat. Remove from heat, add shallot slices, and stir. Let sit until cooled completely, about 30 minutes, then strain shallots. If storing, reserve strained liquid, place shallots in an airtight container, and add enough liquid to just submerge shallots. Discard remaining liquid and store pickles in the refrigerator for up to 1 month. 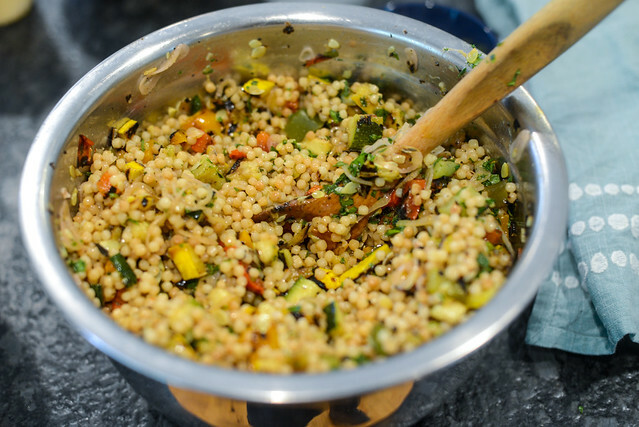 To make the couscous: Place couscous and oil in a medium saucepan over medium heat. Cook, stirring frequently, until roughly half of the couscous turns golden brown, about 5 minutes. Add in water and salt; stir to combine. Increase heat to high and bring to a boil. Reduce heat to medium-low, cover, and simmer, stirring occasionally, until water is absorbed, 9 to 12 minutes. Remove saucepan from heat and let stand, covered, for 3 minutes. 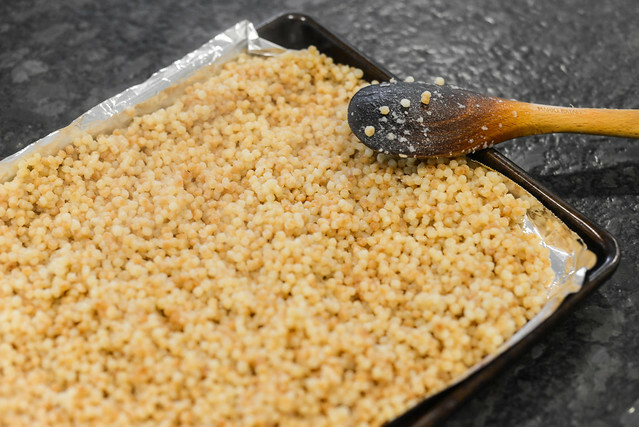 Spread couscous out on a parchment lined baking sheet and allow to cool. 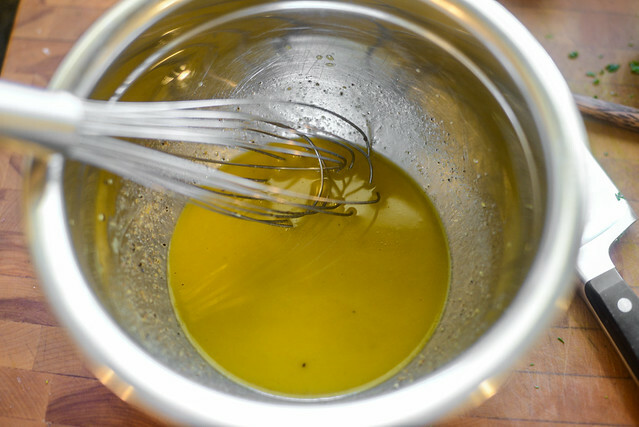 To make the dressing: Whisk together oil, lemon juice, mustard, and paprika in a small bowl. Season with salt and pepper to taste. Set aside. To make the vegetables: Light one chimney full of charcoal. When all charcoal is lit and covered with gray ash, pour out and spread the coals evenly over entire surface of coal grate. Set cooking grate in place, cover grill and allow to preheat for 5 minutes. Clean and oil the grilling grate. 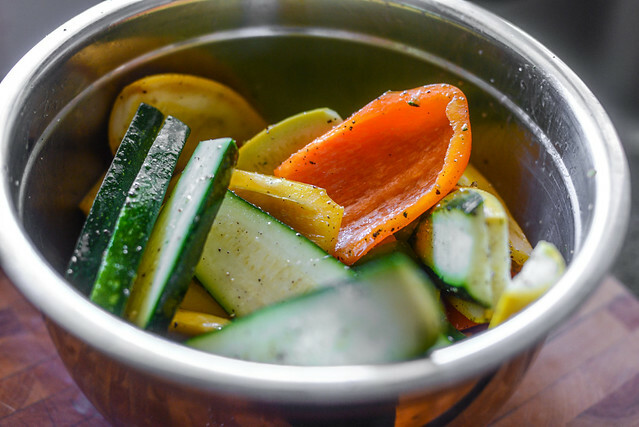 Place all vegetables in a large bowl, toss with olive oil, and season with salt and pepper to taste. 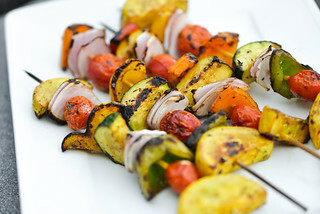 Place vegetables on grill and cook until well browned on both sides, 2-3 minutes per side. Transfer vegetables to cutting board and cut into a medium dice. 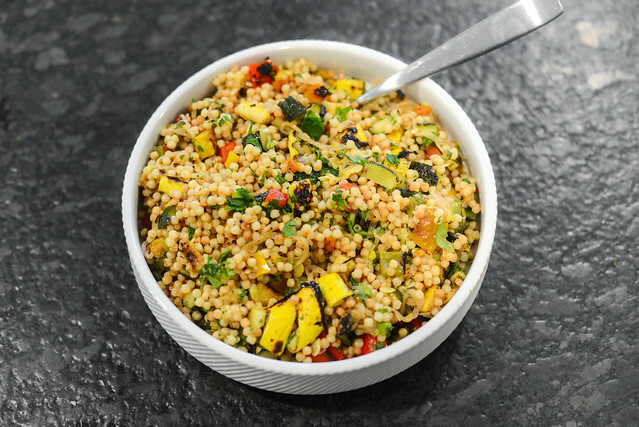 To assemble the salad: Transfer couscous to a large bowl and add in grilled vegetables, pickled shallots, and dressing. Using a large spoon, toss ingredients until uniformly distributed. Season salad with additional salt and pepper to taste. Transfer to a serving bowl and serve immediately.